A lable stuck to a lamppost near the Eriksberg shopping centre. 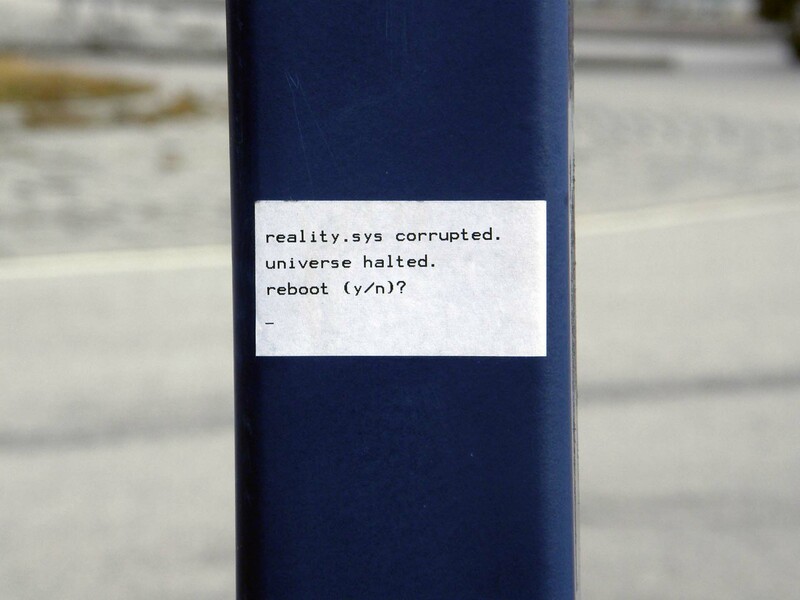 It reads: reality.sys corrupted. universe halted. reboot (y/n)? I took the photo in March 2009 when the expression seemed amusing, and originally posted it on the GBG365 website on 24th March 2014. I’ve recycled it since in various situations and it feels increasingly more appropriate. I wonder how soon it will be before someone feels it’s time to hit Y. Before posting this here, I went on-line and tried to track down the original version. I failed. The earliest example I could find was dated September 2000, (though there were a couple of other uses that might have come from 1999 or even 1998). The various places I found it were in letter suffixes on bulletin board threads or in lists of quotes. In the quote lists it was sometimes identified as by “anonymous” – but usually it wasn’t given even that source reference. I think it’s probably the product of a programmer with a sense of humour. From the look of it, the person who came up with it was familiar with MS.DOS – or, I suppose – Unix (because “.sys”). Occasionally – but not in the earliest examples – I find the quote identified as “Error 405” which I think would make it a Windows error.